Personal injury mediation is an informal settlement meeting, of the parties involved in the personal injury lawsuit. 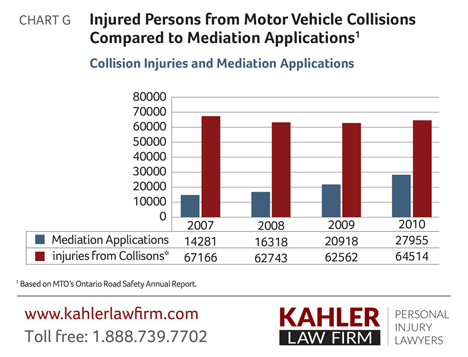 Mediation is a very important part of the personal injury claim process. In Ontario, meditation is a mandatory step before the case is allowed to go to trial. It is held in a conference room, presided over by a professional mediator. The mediator is someone that both lawyers have agreed to. The mediator cannot make any legal decisions, but instead helps the parties explore their own possibilities for settlement. The people who will be present at the mediation meeting are the mediator, the plaintiff, the lawyer for the plaintiff and the lawyer for the defense. There may also be insurance adjusters present at this meeting. The defendant or driver being charged is usually not present and the insurance company representative will act in the defendant’s place. The mediation session opens with introductions of the people who are present: brief explanations of the role of a mediator, and the purpose of mediation. Each personal injury lawyer will briefly outline his client’s case. The plaintiff and the defendant each have the opportunity to tell their side of the story. The mediator will meet with the plaintiff and his lawyer to discuss the strong and weak points of their case. He will meet with the defendant and defense counsel and go over areas of strength and weakness in their respective case. You and your lawyer will meet on your own to discuss settlement goals and options. Each side will explain their objectives for settlement to the group. It is important to be clear on exactly what points you will or will not negotiate on. Each side will have to give and take, in order to hammer out an acceptable settlement. Your lawyer and the defense lawyer may meet on their own, to explore points of agreement. The mediator may meet with the plaintiff or the defendant alone or with the respective lawyers several times as options are offered and considered on each side. Each side tries to make the best settlement deal possible by making offers and counter offers back and forth. Mediation could take a few hours or an entire day, depending on the complexity of the case and points of agreement. Although many cases are resolved in mediation it does not always result in settlement. If settlement is reached the personal injury claim is filed with the court and the case is closed. You should receive your settlement funds within a few weeks. When the parties find out the other side’s perspective on what happened they often begin to understand how the situation which appeared so black and white from their perspective, might be seen from a different point of view. If the case goes to trial, each lawyer will prepare the most convincing case possible, in order to win the judge or jury to their side. Mediation allows the parties to compromise and find settlement terms that are more or less suitable to them. Neither side will completely “win” or completely “lose.” They may settle in favour of a “certain outcome” that is preferable to the “uncertain decision” made by a judge and jury. When a trial lawyer who is recognized for success in the courtroom represents a client, insurance companies are often eager to settle during mediation rather than spend the extra time and money going to trial. If the case does not settle at mediation, the next step is pre-trial. What will my lawyer be doing during mediation?